NOSE: Smells like a British dessert cart. Toffee, plums, raisins, caramel-drizzled sticky buns…lots of big sweetness. It’s not one-note though…there’s a touch of floral hops, a definite alcohol nose-burn, and a hunt of sour fruit. A wonderful nose. TASTE: Similar to the nose, it’s predominantly caramel malt sweetness and toffee cut through with hops, alcohol, and some nice fruity esters. The finish is sweet and smooth and begs you to go back for more. MOUTHFEEL: Full and a touch syrupy, but doesn’t sit too heavy on the palate thanks to gentle, but pervasive carbonation. DRINKABILITY: Old Ales are generally too sweet and too strong to be session beers, but I’ll be damned if this doesn’t come close. All 3 Aleheads drinking this during the Homebrew Maltercation were impressed. I would definitely buy a sixer of this brew. 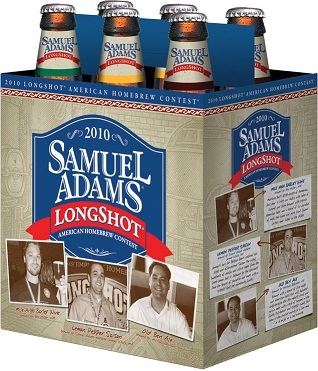 Posted in Tasting Notes.Tagged Longshot, Old Ale, Old Ben Ale, Sam Adams.